Ashdod teen, Jerusalem man hospitalized after suffering head injuries while building Sukkot booths for upcoming holiday. An Israeli teenager was evacuated to Barzilai Medical Center in Ashkelon Sunday after he suffered a head injury while working on a Sukkah for the upcoming Sukkot festival at a local synagogue. MDA emergency medical responders were called to the scene of the accident Sunday after the 15-year-old boy fell off of a ladder while working on a Sukkah (a temporarily domicile used for the holiday). Emergency first responders treated the boy at the scene before evacuating him to Barzilai Medical Center in moderate condition. A day before, MDA paramedics were called to the scene of a similar accident in Jerusalem, after a 24-year-old man was hit on the head by falling piece of wood. First responders evacuated the man in mild-to-moderate condition to Shaarei Tzedek Hospital in the capital. • If you are building a Sukkah in your backyard, make sure that you wear shoes. Also, remove shrubbery that may conceal bugs and reptiles, and check that all paths to the Sukkah are free of obstacles to allow rapid evacuation in case of an emergency. • Build the Sukkah as far from electric devices and gas tanks as possible. 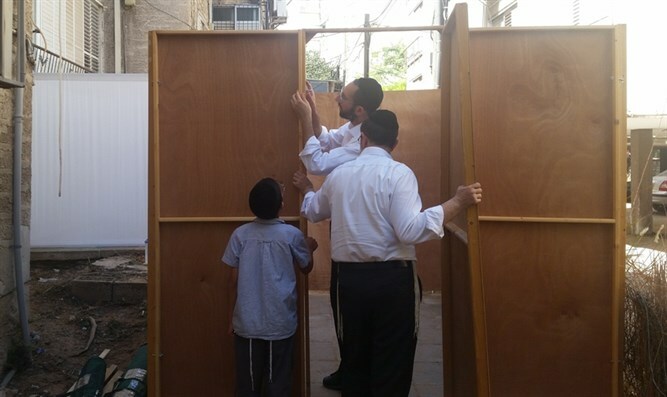 • While setting up the walls of the Sukkah, ensure children are at a safe distance so they don’t get hit. Strengthen the walls to make sure that they don’t collapse. • Be extremely careful while laying the thatch (schach) of the Sukkah. Do not climb on a balcony rail or an unstable ladder. Make sure that the thatch is attached to the Sukkah so that the wind doesn’t blow it away. • Palm leaves have ‘thorns’ that may scratch the fingers and hands of those setting up the Sukkah. Ensure children stay away from palm leaves. Hold the stem under the leaves and not between them, as dangerous bugs may be hiding inside. • While connecting lights or fans in the Sukkah to the electricity, do not touch exposed cords or unsafe sockets. Before you connect to an electrical outlet, make sure that the sockets are intact, are safe for use in the outdoors, and are water-resistant to avoid electrocution. Do not use damaged cords in the Sukkah. • Hanging ornaments – do not stand on rails, unstable ladders, chairs etc. in order to hang ornaments. Make sure that children hang decorations carefully. Always make sure children are under adult supervision. Falling from a ladder or chair can cause damage to the spine, cause concussions and in severe cases, even death. If you or someone around you falls while working on a Sukkah, immediately call 101 or use the “My MDA” mobile app to call MDA teams. Do not move or lift the patient until the arrival of MDA teams to the scene. • Do not leave unsupervised candles in the Sukkah. Always place candles in safe spots in order to avoid fire in the Sukkah. Do not toss cigarette buds in the Sukkah or near it, to avoid a fire. • In any case of a medical emergency, immediately call MDA teams using the 101 emergency line or the “My MDA” mobile app, and adhere to the instructions of the EMTs and paramedics at the dispatch center until the arrival of MDA teams to the scene.